Check here for free downloads! Want to order the "Learning the GBACW" CD-Rom? Order here via email using PayPal! 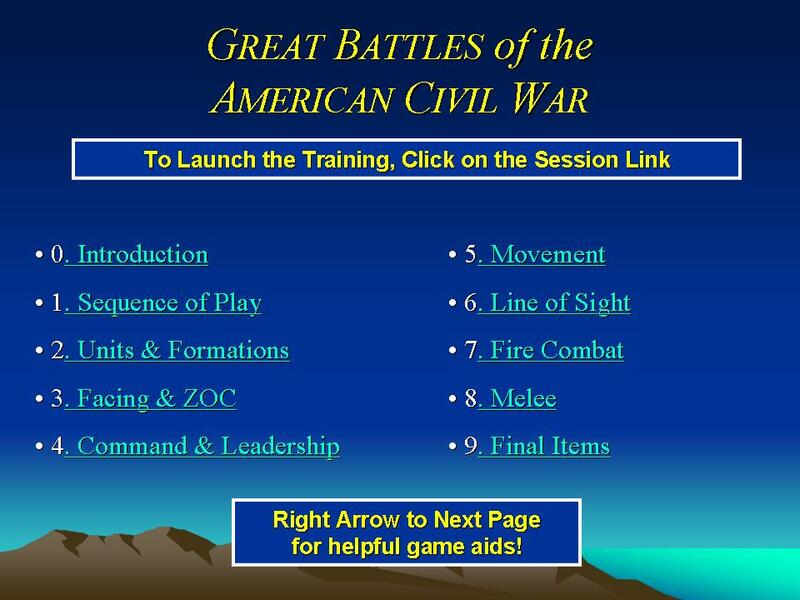 "Learning SPI's Great Battles of the American Civil War" Click to see list of contents! "Strategies for Playing Cedar Mountain" Click here to preview this CD! This is "the player aid GBACW always needed," according to one reviewer! and the Fire chart, Melee chart and "Seeing the Elephant" chart on the flip side! Some information differs between the GBACW rules and the Second Edition TSS rules! So, we have two charts available! TSS Quick Reference Chart: Click here to see sample! GBACW Quick Reference Chart: Click here to see sample! The GBACW chart explains the same as the above, plus Withdrawal, Retreat and Displaced movement and fire. Both versions also reference the rule number so you can quickly check the source! Tired of remembering those important rules changes from game to game? These scenario cards put all the changes for each scenario at your fingertips. Also all the reinforcements, their entry hexes, special terrain rules - and all the important changes to the BCE rules. Laminated on card stock. Cedar Mountain Scenario Card: Click here to see actual file! Special scenario rules explained, reinforcements and entry hexes detailed, BCE changes and all the rest of the vital info available at a glance! Laminated on card stock. Pea Ridge Scenario Card: Click here to see sample! Light woods, Heavy Woods and Fences are all explained - along with the First and second day Victory Conditions. Also all the reinforcements, their entry hexes, special retreat and rout rules, and all the other details are right here! Plus the detailed breakout of the BCE rules for this scenario. Laminated on card stock. Battle of Corinth Scenario Card: Click here to see sample! Some BIG changes on this game from the standard rules - but we have them covered for you. Put all the changes for each scenario at your fingertips. Also all the special terrain rules and the all-important changes to the BCE rules. Laminated, on card stock. Stonewall: Battle of Kernstown Scenario Card: Click here to see sample! Finally - a way to play Stonewall using the GBACW rules! The card puts the rules into an easy to track set of Special Rules, plus charts and notes for Victory Conditions, set up and reinforcements, etc. Also all the special terrain rules and the all-important Army Morale Points for the Union! Laminated, on card stock. PS: When you order I'll include the re-worked 'Exclusive Rules' sheets that fit Stonewall into the GBACW game system - FREE! Preview your order - change quantities - or check out using the View Cart button!